Since Thanksgiving Day is almost upon us and we often have family and friends gathering for a feast -perhaps like the one pictured above? – let’s talk a little turkey about getting through the holiday safely. According to the National Fire Protection Association (NFPA), Thanksgiving is the leading day for home fires involving cooking equipment. On average, US fire departments will respond to 1500+ home cooking fires on this day. 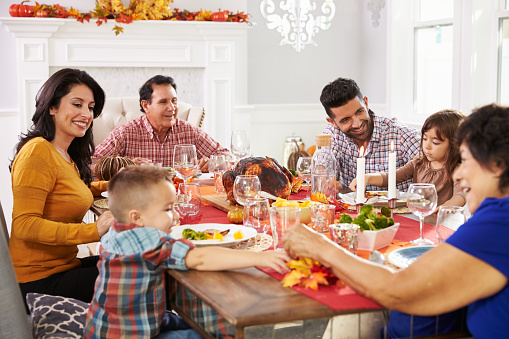 The incidence of home fires also rises on the day before Thanksgiving, Christmas Eve and Christmas Day and unattended cooking was the most common contributing factor in those reported. Not only do these fires cause damage or loss of the structure, they can also cause serious injury or death. I can think of few things worse than losing a home or loved one during a time like this. Let’s keep these following tips from the National Fire Prevention Association (NFPA) in our minds as we prepare our meals and enjoy the holidays. Use extreme caution when handling hot food and liquids. The steam or splash from vegetables, gravy or coffee can cause serious burns. Handle your knives carefully and keep them out of the reach of children. Be sure electric cords from an electric knife, coffee maker, plate warmer or mixer are not dangling off the counter where you could trip or snag them and are not within easy reach of a child. Don’t leave candles unattended and never leave children alone in room with them. Keep those matches and lighters put away as well. If you are planning on frying your turkey this year, make sure that you read, understand, and follow the operating instructions of your fryer and that you are set up in an area away from structures. Keep children and pets away. Getting a food related illness during this time of year would certainly ruin a holiday celebration. The Centers for Disease Control (CDC) estimates that approximately 48 million Americans, that’s about 1 in 6 people, get sick each year from eating undercooked or otherwise contaminated food. Each year, about 128,000 people require hospitalization and approximately 3000 of those will die. While the CDC doesn’t break out what percentage of these numbers occur during the Thanksgiving or other holidays it would be logical to assume that with all the turkeys and other food being cooked and eaten on these days that a spike would probably be seen. There are plenty of websites you can consult to help ensure that your feast is not only safe as well as delicious, but here are few food safety related tips concerning what I consider to be the star eats of the holiday, the turkey! Safely thawing the frozen turkey. Never let it thaw by sitting on the kitchen counter! According to multiple expert sources, my Mom included, there are only three ways to safely thaw a turkey. Slow Method: In the refrigerator. They will require about 24 hrs. for every 5 lbs. of weight. A 15 lb. bird will require 3 days to thaw. Keep it in its original wrapping, breast side up in a baking pan to catch drips. Thawed, it can be kept two days before cooking. Medium Method: In a cold water bath. It will take about 30 minutes for every pound the bird weighs. A 15 lb. bird will take about 8 hrs. Keep it in its original wrapper, place it into a larger leak proof plastic bag and squeeze out excess air, then seal the bag. Placed breast side down in a sink or bucket so that the entire turkey is submerged. Fill with cold water. You may have to place some weight on the bird to keep it totally submerged. Replace the water every 30 minutes. You must cook the turkey immediately after thawing. Fast Method: In the microwave. Times and power setting vary from model to model, so you’ll have to consult your user manual, but it can take less than a couple of hours to thaw depending on the size of the bird. Remove the wrapping and any metal clips, bands or tags. Place breast side up in a microwave safe container to catch drips. After the turkey is thawed and removed from the microwave, you must thoroughly clean the microwave’s interior to prevent cross contamination. Cook the turkey immediately following thawing. To further prevent cross contamination with other foods, wash your hands thoroughly and often, but especially after handling the turkey. Also wash anything that the raw turkey comes into contact with before using it for any other purpose. Cook your turkey to an internal temperature of 165 degrees. Use a meat thermometer to verify this temperature by inserting it into the middle of the breast away from any bone. If you stuff your turkey, be sure to measure its temperature as well. Refrigerate all leftovers promptly, within two hours, at 40 degrees or colder. For me, the only thing that comes close to the experience of eating that wonderful hot turkey on Thanksgiving Day is in being able to eat a cold turkey sandwich the following day! I hope that this Thanksgiving sees you truly blessed and able to find things to be thankful for. Enjoy yourselves and stay safe!